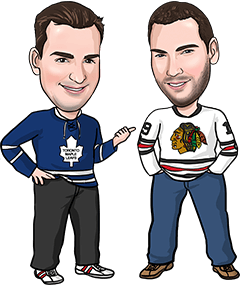 We’re back today after taking a couple of days off from posting to the site, due to the irregular schedule in the NHL this week. Our bets went 2-2 on Monday and we lost our first period moneyline underdog play on the Coyotes Tuesday, putting our season record now at 21-17 for +4 units on our posted personal bets. There are 12 games tonight in the National Hockey League, and we liked betting angles on almost all of them. Below are the 6 picks we’re personally going with for tonight, but also be sure to check out our opinions on the other games as our leans have outperformed our actual picks for the past couple of weeks or so. Good luck with whatever you’re playing, and we’ll be back in a couple of days with a breakdown of Saturday’s 13-game board! Reasons to bet New York: The Islanders won 3 of 5 meetings between the teams last year and are 4-2-1 in their last 7 versus Washington. The Capitals have been held to 2 goals or less in 3 of their last 4 games, 5 of 7 and 6 of 9. Reasons to bet Washington: The Capitals are well rested, having not played since Sunday in Calgary. New York has given up 3+ goals in 6 of its last 7 games and 8 of 10. Reasons to bet New York: The Rangers overcame a 4-2 third-period deficit Tuesday to beat Vegas 6-4 and have now earned points in 5 of their last 7 games (3-2-2). Tampa has allowed 9 goals in its last 2 games. Reasons to bet Tampa: The Lightning is 6-1 at home this season while New York is 0-3 on the road. The Rangers have given up 4+ goals in 5 of their last 7 games. Reasons to bet Philadelphia: The Flyers actually seem to thrive on short rest, going 13-5 in their last 18 games when playing for the 4th time in 6 days. St. Louis has not scored a power play goal in 7 of its last 8 games. Reasons to bet St. Louis: The Blues are 6-0-1 in their last 7 games and are a perfect 5-0 at home. Philadelphia’s lost 4 of 5 games and has dropped 5 of its last 6 visits to St. Louis. Reasons to bet Carolina: The Hurricanes are 3-2 on the road this year, including wins in Toronto, Calgary and Edmonton. Carolina has been shorthanded just 5 times in its last 6 games. Reasons to bet Colorado: The Avalanche has won 4 of 5 at home, scoring 3+ goals in all of those games and 5+ in 3 of them. Carolina has lost 11 of its last 12 trips to Colorado. Reasons to bet Buffalo: The Sabres have won 6 of their last 7 visits to Arizona. The Coyotes are playing their fourth game in 6 days and just returned home from a 5-game road trip. Reasons to bet Arizona: Arizona #1 goaltender Antti Raanta could be back tonight after missing the last 3 weeks due to injury. Excluding empty netters, Buffalo has been held to 2 regulation time goals or less in 8 of its last 10. Reasons to bet Toronto: The Leafs snapped a 3-game losing streak with a 3-1 win last night in Anaheim, improving to 4-2 on the road. Los Angeles is playing its first home game following a 6-game eastern road trip. Reasons to bet Los Angeles: The Kings are 4-0-1 at home and have had the past 2 days off. Toronto is playing for the second straight night and fourth time in 6 days. Reasons to bet Vegas: The Golden Knights are averaging 3.7 goals per game and have scored 3+ goals in 9 straight. Vegas beat Boston 3-1 two weeks ago in Vegas. Reasons to bet Boston: The Bruins have earned points in 5 of 6 home games (3-1-2) and should be motivated by that recent loss to the Golden Knights. Vegas is using its fourth-string goaltender and has allowed 6 goals in each of its last 2 games. Reasons to bet Columbus: The Blue Jackets have won 3 of their last 4 games. Florida allowed 8 goals Monday at home to Tampa and has given up 3+ goals in 7 of its last 8 games. Reasons to bet Florida: The Panthers have scored 5+ goals in 4 of their 6 home games this year. The home team is 7-0-2 in the last 9 meetings between these teams. Reasons to bet Detroit: The Red Wings have won 4 of the last 5 meetings and 7 of the last 9, and they’re 9-2-1 in their last 12 trips to Ottawa. The Senators gave up 8 goals Monday against Montreal, the third straight game they’ve allowed 4+ goals. Reasons to bet Ottawa: The Senators should be motivated to rebound from Monday’s embarrassing loss on home ice, and they’ve won 6 of their last 8 following a loss at home by 3 goals or more. Detroit’s allowed 3+ goals in 7 of 9. Reasons to bet Dallas: The Stars have won 6 of their last 8 games, claiming their last 2 by identical 2-1 scores. Winnipeg has scored 2 goals or less in 3 of its last 4 games and 5 of 7. Reasons to bet Winnipeg: The Jets are 6-1-2 in their last 9 games, allowing 2 goals or less in 7 of those contests. Dallas has scored 3 regulation time goals in its last 2 games after scoring 16 in its previous 4. Reasons to bet Montreal: The Canadiens have scored 5+ goals in 3 of their last 4 games, including an 8-goal eruption Tuesday in Ottawa. Minnesota has scored 1 goal or less in 2 of its last 4 games, and 2 or less in 3 of 4. Reasons to bet Minnesota: The Wild has won the last 5 meetings, holding Montreal to a total of 6 goals during that span. Montreal has allowed 3+ goals in 8 of its last 9 games. Reasons to bet Pittsburgh: The Penguins have held opponents to 2 goals or less in 4 of their last 5 games. Calgary has scored 2 regulation time goals or less in 6 straight games and 7 of its last 8. Reasons to bet Calgary: The Flames have allowed 4 even strength goals in their last 6 games (excluding empty netters). Pittsburgh is 0-4 this year when playing for the second straight night, and has been outscored 29-7 in those games.